Seeking to minimize Internet's susceptibility to spoofed DDoS attacks, we are developing and supporting open-source software tools to assess and report on the deployment of source address validation (SAV) best anti-spoofing practices. This project includes applied research, software development, new data analytics, systems integration, operations and maintenance, and an interactive analysis and reporting service. We have developed and support a new client-server system for Windows, MacOS, and UNIX-like systems that periodically tests a network's ability to both send and receive packets with forged source IP addresses (spoofed packets). We are (in the process of) producing reports and visualizations that will inform operators, response teams, and policy analysts. The system measures different types of forged addresses, including private and neighboring addresses. The test results will allow us to analyze characteristics of networks deploying source address validation (e.g., network location, business type). We generate a summary report on the current "state" of Internet IP source address spoofing/filtering using data from an active measurement tool. Thus far, we've collected data from thousands of clients, networks and providers. More details and published results from our research are also available. Please help! By downloading and running our client software, you'll help advance the collective understanding of how to better protect the Internet. See screenshots of the tester in action, and a FAQ if you have questions. The following client packages are available. The sources should compile on any POSIX system. Please contact the mailing list with any issues or questions. 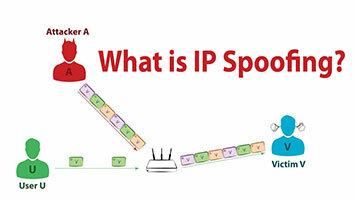 Why does IP spoofing matter? Our FAQ covers common questions about spoofing relevance. The IP spoofing vulnerability is the most fundamental vulnerability of the TCP/IP architecture, which has proven remarkably scalable, in part due to the design choice to leave responsibility for security to the end hosts. Thus, the TCP/IP Internet architecture includes no explicit notion of authenticity. New spoofing-based attacks regularly appear (most recently against the DNS infrastructure) despite decades of previous exploits and prevention/tracing attempts. 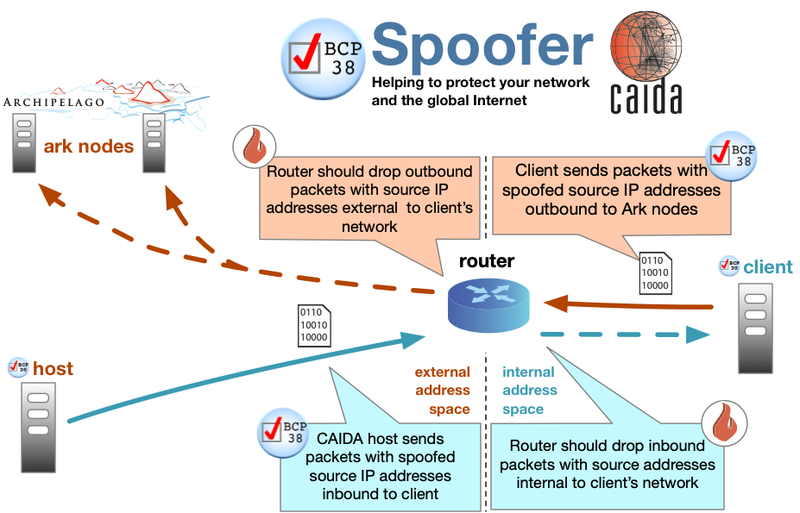 Current spoofing prevention mechanisms suffer from incentive issues (employing filtering does not prevent a provider from receiving spoofed source packets), deployment difficulty and management complexity. Our research seeks to inform architectural design, and security and policy mechanisms for preventing future attacks. Qasim Lone, Matthew Luckie, Maciej Korczyński, Michel van Eeten, PAM 2017. Robert Beverly, Ryan Koga, and k claffy, Internet Society Article 2013. Robert Beverly, Arthur Berger, Young Hyun, and k claffy, ACM SIGCOMM/USENIX IMC 2009. Robert Beverly and Steven Bauer, USENIX Security 2007 (poster). Robert Beverly and Steven Bauer, USENIX SRUTI 2005. DHS DDoSD PI meeting, kc claffy, 2018. DHS R&D showcase, kc claffy, 2017. One Conference, kc claffy, 2017. DHS DDoSD PI meeting, kc claffy, 2017. DHS DDoSD PI meeting, Matthew Luckie, 2016. DHS R&D showcase, kc claffy, 2016. DHS S&T DDoS Defense meeting, kc claffy, 2015. IMC 2009, Robert Beverly, 2009. CAIDA AIMS Workshop, Robert Beverly, 2009. NANOG 34, Robert Beverly, 2005. We welcome questions and feedback to the Spoofer Information Mailing List and invite users to join the Spoofer Users Mailing List for discussion and announcements. The Spoofer project is sponsored by the Department of Homeland Security (DHS) Science and Technology Directorate, Homeland Security Advanced Research Projects Agency, Cyber Security Division (DHS S&T/HSARPA/CSD) BAA HSHQDC-14-R-B0005, and the Government of United Kingdom of Great Britain and Northern Ireland via contract number D15PC00188. The views and conclusions contained herein do not necessarily representing the official policies or endorsements, either expressed or implied, of DHS, the U.S. Government, or the Government of United Kingdom of Great Britain and Northern Ireland. Project originally invented and hosted by MIT ANA.